jlayout 是一個可以把 GUI configuration 與 Java code 分開處理的 tool. 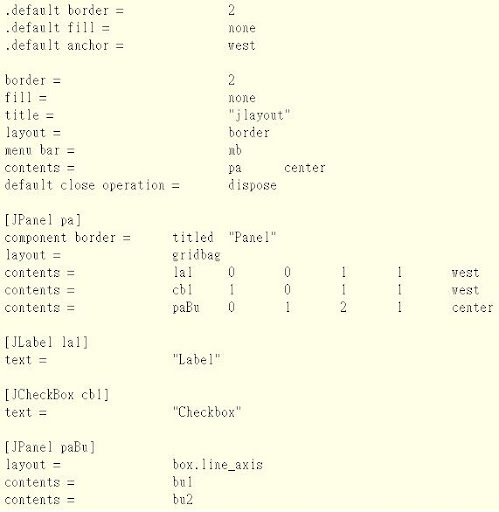 遵從 jlayout 的 annotation 以及 configuration 語法, 可以把原先 Java code 中一大串的 GUI code 部分以少量的 annotation 取代掉, 而在 configuration file 上是以對每個 object 獨立作 configuration 的方式, 指定 object 的 state, 以及 objects 之間的 association. 整體概念可以簡單用下圖說明. 概念上跟 CSS 之類的有點相似, 但是 jlayout 沒有辦法支援長相一樣的 GUI objects 使用同樣的 configuration, 當然就更別說 styles 之間的 inheritance 關係. 從 configuration file 的長相可以看到其實 jlayout 在 code 跟 configuration file 之間還是有蠻強的 coupling. 需要依靠 object name 作為 configuration deployment 的依據, 也幾乎每一個 GUI object 都需要一個獨立的 configuration section. 換句話說, jlayout 提供的好處其實只有可以縮短原先 Java code 內的繁雜長串 GUI 部分, 以及可以透過 text-based configuration 調整 GUI object 的 state, 以及 GUI objects 之間的 associations. 進行調整時, 因為許多 method call 的 code 被省略了, 因此可以用更簡潔一點的方式作調整. This entry was posted on 上午10:38 and is filed under java , software gui . You can follow any responses to this entry through the RSS 2.0 feed. You can leave a response, or trackback from your own site.